Community served with a side of slaw. Geno Allen believes that the southeast corner of Benzie County could be as bustling as it was during the early 1900s when Thompsonville was a railroad town, and he is doing his part to bring about a second boom. Perched on the corner of Front St. and Thompson Ave. in downtown Thompsonville, Geno’s Sports Bar and Grill is a hub of activity in a rural town that has struggled to maintain its vitality. “It’s all about keeping that small-town connection that makes this area so special,” he says. Geno Allen serves up his famous ribs. Photo by Aubrey Ann Parker. 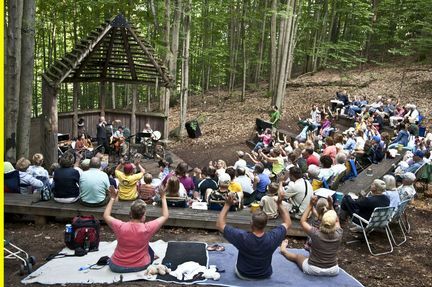 Allen, a native of Benzie County and graduate of Benzie Central, returned to his hometown of Thompsonville in 2008. He was looking for an opportunity that would allow him to stay in the area after 28 years of working downstate when he stopped into the local bar and struck up a conversation with the owner. After negotiating a deal, Allen moved from the patron side of the bar to the owner’s side. 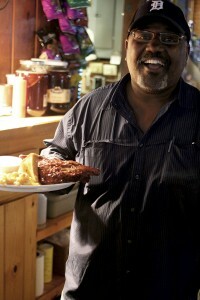 In the five years since Allen bought the bar, he has built a solid reputation for offering customers good service and great food at amazing prices, while creating a cornerstone business to anchor the local community. 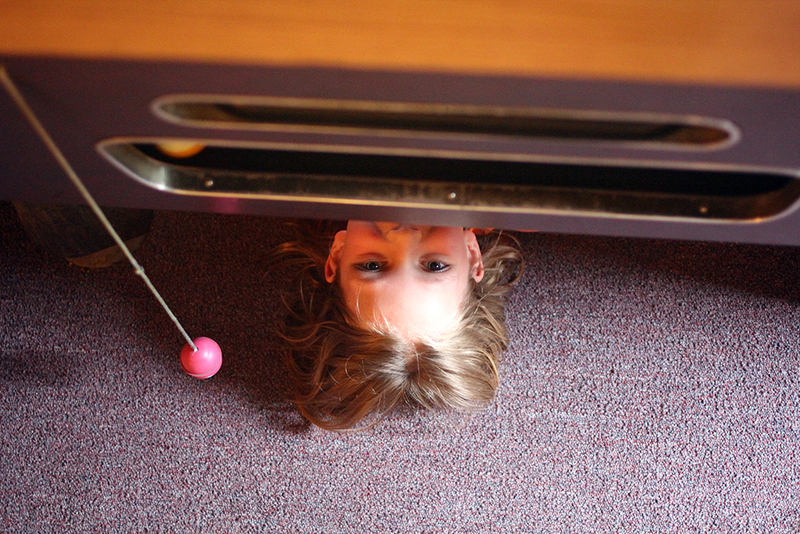 Converted pool table also makes for a great hiding spot. Photo by Aubrey Ann Parker. 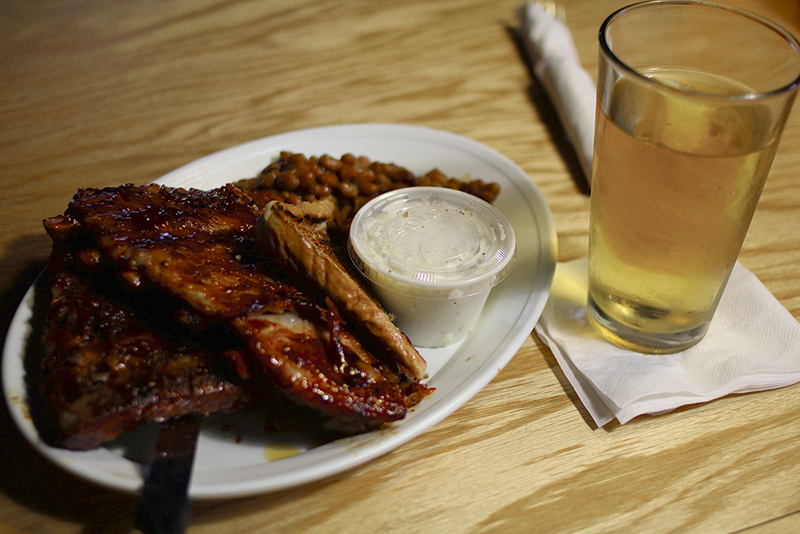 Ribs are only served on Thursday nights, but sports fans can delight throughout the week. 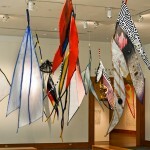 A fan of all things sports, one of the first changes Allen made was to increase the number of televisions. Geno charters a bus each year and takes Detroit Tiger fans to a game. This year the bus heads down for the July 19th game vs the Cleveland Indians. Photo by Aubrey Ann Parker. Allen is a ‘home team’ fan, proudly supporting Detroit teams. One day every summer, he provides an opportunity in which lucky fans can come to the restaurant to meet with and get autographs from a former Lions player. 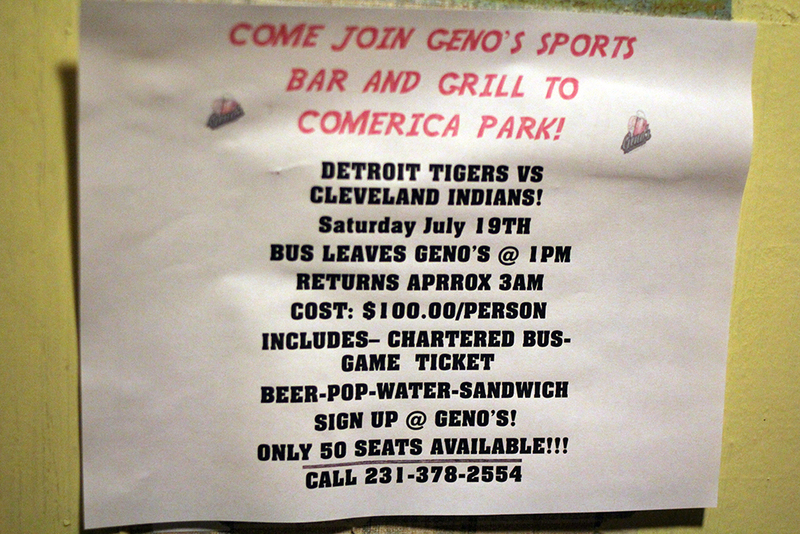 In addition, Geno’s will fill a bus with fellow sports fans on July 19 and head down to Detroit on an annual trip to catch a Tigers baseball game. And on August 16, Geno’s will present an inaugural golf outing at Crystal Mountain that will give participants the opportunity to play in a scramble that features former Detroit Lions players. Proceeds from the outing will benefit the Gridiron Greats, a charity that provides funds for former NFL players who have trouble paying for medical expenses incurred during their playing days. Though he has created a great place for patrons to come grab a drink and watch their favorite teams after a round of golf or snowmobiling the Betsie Valley Trail, Allen thinks of his place as a family-style restaurant where people can bring their children and not have to worry about inappropriate language or rowdy behavior. When the restaurant gets really packed, the pool table can even be converted into a dining table via a custom-made wood top. No matter the season, Geno’s tries to provide an occasion for people to come to T-ville. On Wednesday nights starting after Memorial Day, the restaurant will have live music on the deck. Geno’s is home to pool and euchre leagues in the winter; a beanbag league and the popular bike night and classic car show in the summer. The restaurant also features a shuffleboard table—a rarity in bars nowadays. “It’s the same one that I used to play on when I was a kid,” Allen says. It is easy to see that with his lightning white smile and contagious laugh, the owner of Geno’s immediately puts people at ease. He seems to have a personal connection with everyone who walks in the door, and the community supports him as much as he does them. 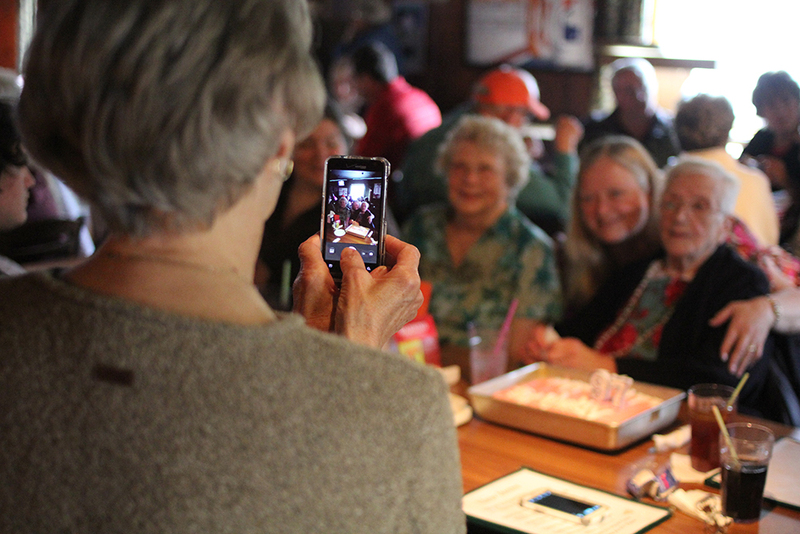 A long-time resident of Thompsonville celebrates her 97th birthday at Geno’s. Photo by Aubrey Ann Parker. A knowledgeable staff makes sure those looking to belly up to the bar will be well tended to, with full liquor offerings and the tap handles featuring PBR and beers from Michigan’s Mt. Pleasant Brewing Co. and Founders Brewing Co. From the kitchen, Geno’s offers a solid list of traditional pub offerings, ranging from the half-pound T-ville Burger to handmade pizza to hearty home-style offerings like meatloaf and a broasted chicken dinner. On the healthier side, diners can get a wrap or salad. And be sure to try one of the soups, all of which are made from scratch. The menu also offers little unique surprises such as hot popped pork rinds, which are like deep fried pillows of goodness. Nearly everything is priced below $10, including a full list of appetizers, many a mere $3. From coney dogs to tacos, Geno’s boasts a rotating schedule of daily specials that make a great deal on food even better. Though a staple in Northern Michigan, Geno’s take on Friday fish fry is unique in that, along with traditional cod and perch, the restaurant also offers bluegill when available. Geno’s Sports Bar and Grill is open seven days a week, Sunday through Thursday from noon to 11 p.m., and Friday and Saturday from 11 a.m. to 2 a.m.
All photos by Aubrey Ann Parker.